GET READY FOR THE BIGGEST WAYMARK COOKIE OF THEM ALL!!! Don't you just love verses such as the one above – when they show up by Divine Providence, they are sooooo plainly obvious to those that seek. Up until the year 1603, the English Anglo Saxons [Joseph] and [Judah] Celtic Scot's crowns and thrones were as separate as two sticks lying side by side. However, in 1603, there came about unification of these two kingdoms and from that day until the present, ONE Monarch reigns over the United Kingdom of Israel. In 1603, a member of the Stewart Dynasty, King James VI, succeeded to the English Crown, uniting the throne and the crown, however, the Union of the Parliaments took place in 1707. Today, the two Crowns remain united under ONE single Sovereign, that of the present Queen Elizabeth, but there is more. Two 'sticks' were made ONE. James’ reign was from March 24, 1603 to March 27, 1625. He was born on June 19, 1566 at Edinburgh Castle in Scotland. James died on March 27, 1625. King James was from the Royal House of Stuart, and was the son of Lord Darnley and Mary, Queen of Scots. Upon the arrival of James I in London, he was almost immediately faced by religious conflicts in England. James was presented with the Millenary Petition; which supposedly contained one thousand signatures of Puritans requesting further Anglican Church reform. He accepted the invitation to a conference in Hampton Court, subsequently delayed due to the dreaded plague. In 1604, at the Hampton Court Conference, James was unwilling to agree to most of their demands. He did however; agree to fulfill a request that was to have a far-reaching effect by authorizing an official translation of the Bible, which came to be known as the King James Bible. The ‘Treaty of Union’, which declares that England and Scotland shall become one kingdom with the same monarchy and succession with equal trade and economic rights, was fully implemented in the year 1707. When the Treaty was drawn up, it began its progress first through the Scottish Parliament, beginning October 1706, ratified January 1707, and then through the English Parliament [ratified March 1707]. The Act of Union of 1800 merged the Kingdom of Ireland and the Kingdom of Great Britain [itself a merger of England and Wales and Scotland under the Act of Union 1707], to create the United Kingdom of Great Britain and Ireland on 1 January 1801. “The state of monarchy is the most supreme thing upon Earth, for kings are not only God’s lieutenants upon Earth, and sit upon God’s throne, but even by God himself are called Gods... and so their power after a certain relation compared to divine power... for if you will consider the attributes to God, you shall see how they agree in the person of a king... to dispute what God does is blasphemy... so it is sedition in subjects to dispute what a king may do in the height of his power. I would not have you meddle with such ancient rights of mine as I have received from my predecessors...” Source: this was written by King James I. 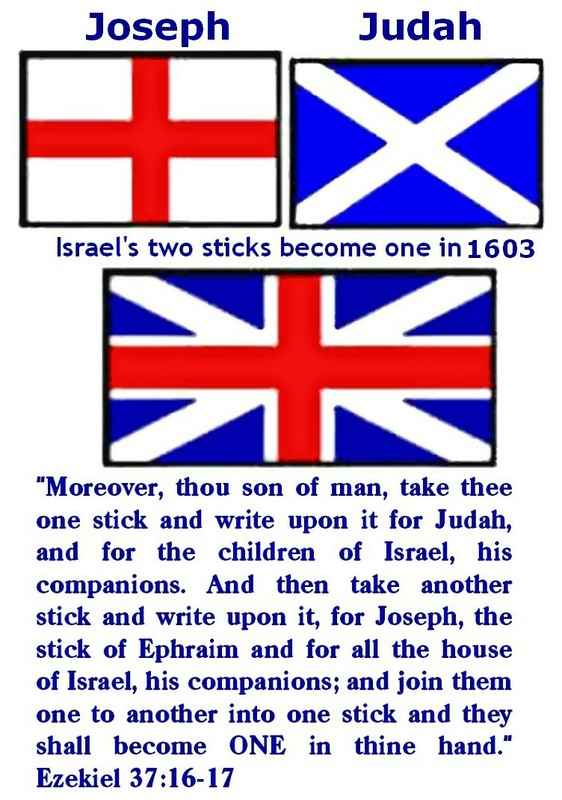 Now for the two sticks that became one: The Scottish flag depicts the stick for Judah, which has a pretty blue field [background] with a white Saltier [X shaped cross] that goes from corner to corner. This Saltier Cross is known as Saint Andrew's Cross. The flag of England depicts the stick of Ephraim, which has a pure white field [background] and a bright red cross, which is called the St. George's Cross. When these two 'sticks', or Crosses, are put one on top of the other, you have the flag of the United Kingdom of Great Britain. This flag is called the 'Union Jack', or the union of Jacob. “Howbeit the Lord God of Israel chose me before all the house of my father to be king over Israel forever: for he hath chosen Judah to be the ruler; and of the house of Judah, the house of my father; and among the sons of my father he liked me to make me king over all Israel.” Source: King David speaking. Could have been the words of King James I.
Deut 33:7 ‘And this is the blessing of Judah: and he said, Hear, Lord, the voice of Judah, and bring him unto his people [Judah was brought to his people, Israel]: let his hands be sufficient for him; and be thou an help to him from his enemies’. After Babylon murdered Judah’s King Mattahniah aka Zedekiah, and the crowned Princes; the remnant of Judah was brought to their brethren people [by Jeremiah], in the height of the northern Isles [Scotland], and the Lord blessed and helped Judah’s remnant, and the tender twigs [princesses] became a powerful nation of people, keeping in tact the throne of David as promised - forever. 1 Chronicles 5:1 ‘Now the sons of Reuben [France] the firstborn of Israel, for he was the firstborn son; but forasmuch as he defiled his father’s bed, his birthright was given unto the sons of Joseph the son of Israel: and the genealogy is not to be reckoned after the birthright’. Here we see that the birthright went to Ephraim. Psalms 60:7 ‘Gilead is mine, and Manasseh is mine; Ephraim also is the strength of mine head; Judah is my lawgiver. Gilead is a 'heap of stones', such as in England. King James brought forth the ‘King James Bible’, he was the chief lawgiver. The two sticks have been joined together – there can be no doubt in anyone's mind about who Judah and Ephraim are today. The two sticks, laid one on top of the other, refers to the flag of Great Britain. For more on the two sticks that became one, see CLUE #27 in the "Sounding of the Shofar".